In Blood Diamond, Djimon Honsou is Solomon Vandy, the fisherman whose village is burnt down; while his son Dia (Kagiso Kuyperr) is brainwashed by a charismatic warlord (David Harewood) to be a ruthless child soldier, Solomon himself becomes a slave, mining diamonds for the same man. Leonardo DiCaprio is Danny Archer, a Rhodesian smuggler cynically out to get his own, and assuming everyone else is doing the same. Jennifer Connelly is Maddy Bowen, the guilty-liberal American reporter who wants to win the Pulitzer, help out suffering Africans, and sleep with Archer, not necessarily in that order. Honsou is sturdy, and Connelly does what she can with a rather cliched role, but it's DiCaprio who gets the richest character, and he runs with it. He also offers an interesting key to the film's uncertain perspective - sympathizing with Africans, yet seemingly identifying with Westeners; as a white African, Archer can negotiate between the control of Europeans, Americans, and former African colonial overlords and the suffering of native (at least by birth) Africans in a land of war and brutality. This is especially clear in the ending, in which Solomon is restored to his son, Maddy gets her story (along with a broken heart), and Archer (whom we think of only by his last name, like a hotshot spy or something) plays the martyr, dying alone on a hill, under fire, a sacrificial lamb because he lacks either Solomon's rooted goodness or Maddy's essentially innocent outsider status. Archer's in-between identity is highlighted by his farewell phone call to Maddy - she's at a posh street site somewhere in upscale Northern Europe, while Archer is sweating it out in the jungle. He can't escape his fate, yet he can communicate with the other world; this very intermediary status enabled him to assist Solomon in the first place. This a rather fascinating and enticing conceit the more you think about it, and not at all uncommon of the more sophisticated and satisfying Hollywood movies which appeal both to an audience's desire for mobility, savvy, and at least some sense of power along with its need for a rooted sense of suffering and survival, so that the character's "cool" cache seems earned. In this case, it allows the film to span an inside and outside perspective on exotic Africa. 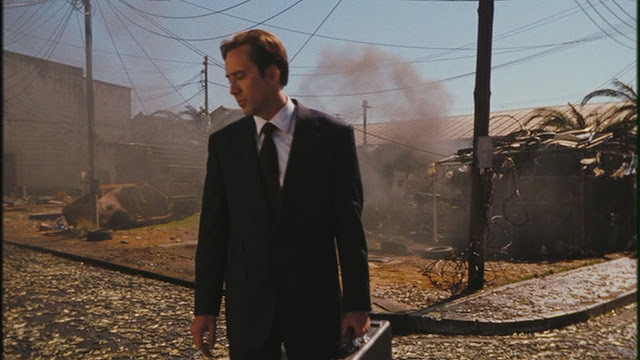 Lord of War, meanwhile, fully and (at least initially) unapologetically embraces a Western view of the 90s conflict in Sierra Leone and Liberia (and by implication, later conflicts as well). Yuri Orlov (Nicolas Cage) is a conscienceless arms dealer, a Ukranian emigre from Brooklyn who narrates his own story, a classic rise-and-fall opus in which Orlov wines and dines dictators, plays cat-and-mouse with Interpol on the open seas, and marries a supermodel who sees, hears, and speaks no evil (at least not initially). The film has been described (and decried) as Blow with guns instead of drugs, and so it is but I'm a sucker for this form of narrative and was engaged throughout. What's odd about Lord of War is that usually rise-and-fall movies depict criminals whose only victims are either fellow players or customers who (presumably) should know better - obviously a lot of drugs wound up in inner cities, but watching Blow you'd think they were delivered exclusively to homes with swimming pools. In these films, the antihero's fall is due more to hubris than true villainy, and it's our barely guilty pleasure to root for the antihero throughout. Lord of War initially feeds into this dynamic, through both director Andrew Niccol's fast-paced, wildly stylized direction and Ethan Hawke's unsympathetically smug self-righteousness as the Interpol agent tracking Orlov. When Orlov empties a jumbo jet in a matter of minutes, just barely skirting Valentine's seizure of his goods, we're primed to applaud his chutzpah. But it's much harder to avoid the body count of guns than of drugs, and so Niccol is confronted by a challenge: how to shift gears from Orlov's badass hijinks to recognition of the brutal exploitation he's been involved with? Niccol solves this dilemma by offering a twist on the rise and fall timeline: when Valentine finally captures Orlov, the gun-runner correctly predicts that a highly-ranked U.S. official will soon arrive to ask for his release. As a supplier to U.S. clients, Orlov is too valuable to American foreign policy - so as his career continues to soar, Orlov's only punishment arrives in the form of personal loss; otherwise crime does pay in Lord of War's sober conclusion. This interesting attempt to pivot is not fully effective because the change in tone never really pulls the rug out from under the film's earlier viewpoint. We could rewind the film and not see it any differently; the slick pyrotechnics would still play as fun rather than suddenly, horrifyingly all-too-real. For a true grounds' eye view of what global tornadoes have been wrought by narcissistic butterflies like Orlov, one must ultimately look elsewhere - perhaps to films created by Africans themselves.